You probably know a family who struggles to make ends meet. They are not alone. Alabama’s economy continues to lag behind the nation’s. Alabama’s median household income is just $46,309, or $11,308 less than the national median household income. This income gap keeps growing, and many Alabamians can’t keep up with the cost of necessities like housing, child care, food, transportation, and health care. 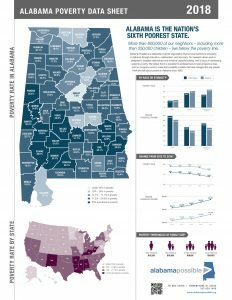 There is good news to share: poverty is at its lowest rate since we started publishing the Alabama Poverty Data Sheet in 2010. Just over 800,000 Alabamians live below the poverty line, which is $24,257 for a family of four. While fewer people live in poverty, it continues to impact every corner of the state, and 15 of Alabama’s 67 counties have a poverty rate higher than 25 percent. Another eight counties have a poverty rate higher than 30 percent. Alabama is the sixth poorest state in the U.S.
Alabama’s child food insecurity rate is 22.5 percent, which is higher than the national average of 17.5 percent. Alabama has a notably high food insecurity rate at 17.7 percent. Please use the data sheet to guide your policymaking efforts by convening stakeholders, focusing attention on the need, cultivating high aspirations, and supporting work that effectively removes barriers to prosperity in Alabama.